It's disturbing to think that in 1000 years, most of London could be completely underwater as a result of climate change and rising sea levels. 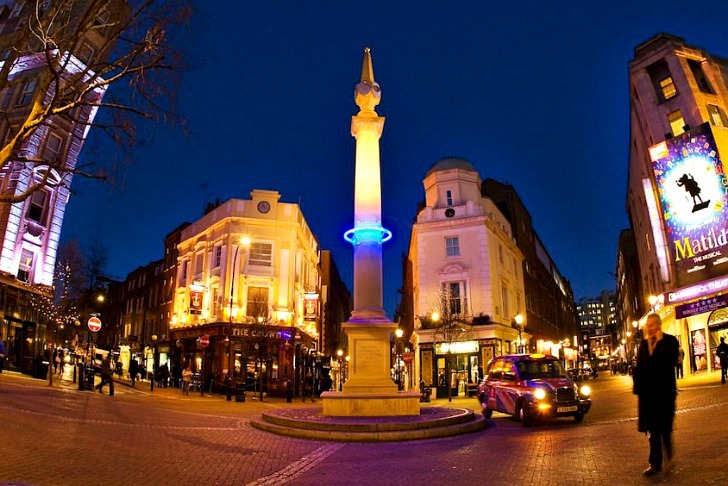 To raise awareness about this unsettling reality, London artist Michael Pinsky placed blue LED markers on three famous monuments to show just how far waters are expected rise. The markers are placed at a height of 28 meters from sea level on the Duke of York Column, the Paternoster Square Column and the Seven Dials Sundial Pillar as part of Pinksy's Plunge installation to envision the year 3012 when sea levels have risen and completely changed the city of London as we know it today. Pinksy wanted to raise awareness about what could happen if we stick to our business as usual scenario and do not reduce carbon emissions. The result after 1000 years is a complete transformation of our world and sees London completely submerged in the water. Pinksy chose a sea level rise of 28 meters in 1000 years – the most extreme case – to show what the full extent of the damage could be. The IPCC is predicting a global sea level rise of between 18-59 cm by the end of the century, but this could even become as great as 2 meters as more time goes by. For Plunge, Pinsky chose three famous monuments around the city that thousands of people walk by every day to show just how far the sea levels could rise. All three pillars are located north of the Thames in prominent locations sited near other important buildings. A ring of low energy, blue LED lights is mounted on each pillar at the proper height and each ring glows both day and night illuminating the adjacent buildings (such as Buckingham Palace and St. Paul’s Cathedral) to see what else might be underwater. You can also use the interactive Plunge tool to see how far your home town would be underwater. Plunge is the work of Michael Pinsky with the assistance of Artsadmin and LIFT. The installation went up on February 7th and will be up through March 4th, 2012. Pinksy wanted to raise awareness about what could happen if we stick to our business as usual scenario and do not reduce carbon emissions. The result after 1000 years is a complete transformation of our world and sees London completely submerged in the water. Pinksy chose a sea level rise of 28 meters in 1000 years - the most extreme case - to show what the full extent of the damage could be. The IPCC is predicting a global sea level rise of between 18-59 cm by the end of the century, but this could even become as great as 2 meters as more time goes by. 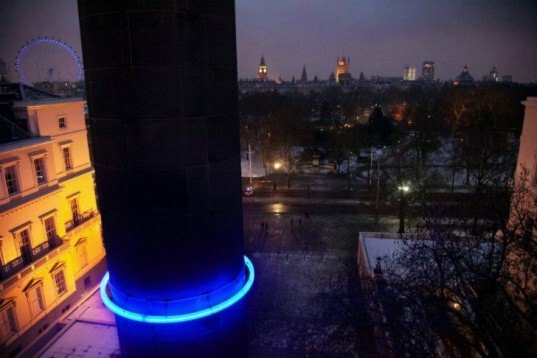 A ring of low energy, blue LED lights is mounted on each pillar at the proper height and each ring glows both day and night illuminating the adjacent buildings (such as Buckingham Palace and St. Paul's Cathedral) to see what else might be underwater. You can also use the interactive Plunge tool to see how far your home town would be underwater.